The fifth annual London Value Investor Conference will take place on Thursday 26th May 2016 at the QEII Conference Centre in Westminster; with speakers including Howard Marks, Jean-Marie Eveillard and James Montier. Both Howard Marks and Jean-Marie Eveillard will hold extensive audience Q&A sessions hosted by the conference moderators: David Shapiro of Willis Towers Watson and Richard Oldfield of Oldfield Partners. 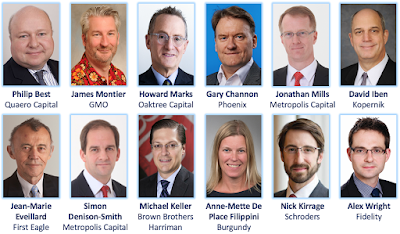 The conference will also be a showcase for less well known fund managers to present detailed investment ideas: click here for the full speaker line-up. Two other features of the conference this year are the Value Investor Awards (for which nominations are currently being accepted) and the London Value Investor Conference Dinner which takes place in the Members Dining Room at the House of Commons after the conference finishes.